In this example, SF is an IOU instance running on host “solaris”. IOUlive is also running on this host, bridging SF’s Ethernet0/0 interface to my physical network (and to the world). SJ1, SJ2, and SJ3 are IOU instances running on host “helium”. 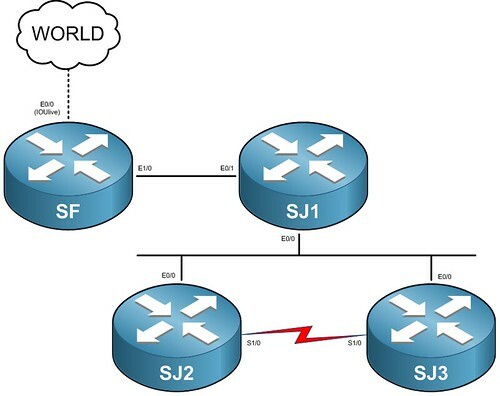 The Ethernet1/0 interface on SF is connected to Ethernet0/1 on SJ1 are connected, even though they are on separate physical hosts. The Ethernet0/0 interfaces on SJ1, SJ2, and SJ3 are connected, sharing a common network segment. Last, SJ2 and SJ3 are connected via their Serial1/0 interfaces. Hopefully, this should be good enough to demonstrate the various options for connecting IOU instances. When connecting IOU instances across physical hosts, the hosts should share a common NETMAP file. If it isn’t possible to use NFS, you’ll need to duplicate the file on each host. I’m not running NFS at home, so I’ve simply copied the file over to both hosts. /dev/hme0 is the NIC on solaris that is connected to my network. Looks like we’re all set! Note that SF is running on the physical host “solaris”, a Solaris 8/SPARC box, and SJ1 is running on the physical host “helium”, an Ubuntu 10.04/x86 box. Looks like everything is working properly. I hope this post was helpful. I welcome your feedback in the comments section below!